What is alpha hydroxy acid and how can it help my skin? There are so many different products available in skin care that is difficult to know where to start. So I have written this short review of alpha hydroxy acid and glycolic acid, to help you decide which type of product is best for your skin. Let’s start by looking at alpha hydroxy acid, otherwise known as AHAs. What is alpha hydroxy acid? Alpha hydroxy acids are a group of water soluble chemicals that are well-known for their exfoliating properties and are popular ingredients in many skin care products. The exfoliation helps to renew your skin and give it a smoother and more radiant glow. They can be naturally occurring or synthetic and the common ones include glycolic acid, lactic acid and citric acid. They are only weak acids (don’t confuse them with house cleaning acids or industrial acids) and are considered safe when used in skin care products, so long as their dosage is within FDA recommended limits. After a number of safety reviews, in 2005 the FDA recommended that glycolic acid and lactic acid are both safe for use in cosmetic products if their concentrations are 10% or below. This limitation is because alpha hydroxy acid products may increase the sensitivity of your skin to the sun and may cause sunburn. They also recommend that you wear sunscreen and protective clothing in the sun while using alpha hydroxy acid products and for a week after ceasing its use. The FDA has also recommended that alpha hydroxy acid products with a concentration of 30% or less are safe to use in salon products, if their usage is brief and is followed by a thorough cleansing of the skin – when applied by trained professionals and sun screen precautions are taken. Glycolic acid is an alpha hydroxy acid derived from sugar cane, which can be made synthetically and is very popular in skin care products. The ability to penetrate the skin is an important characteristic of exfoliators. This is why glycolic acid is so popular in skin care products, because it has the smallest molecular size of all the AHAs, easily penetrating your skin (it has high bioavailability). 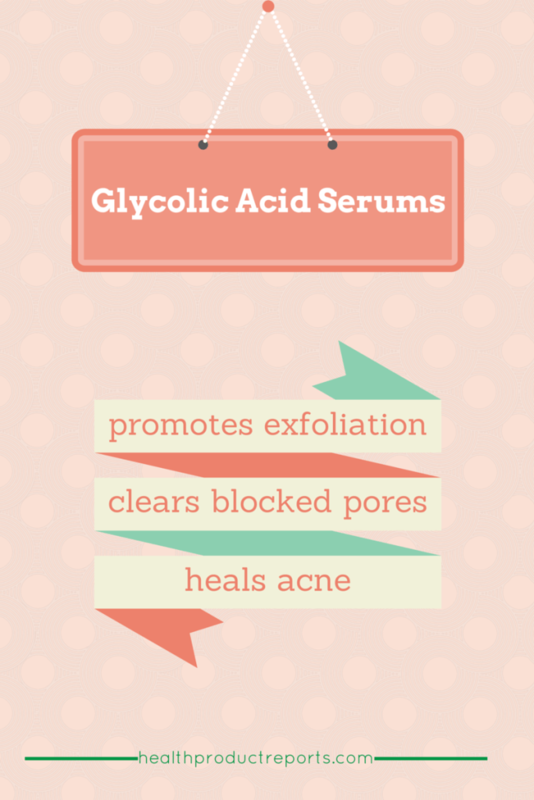 What does glycolic acid do? At concentrations of 10% or below, glycolic acid promotes exfoliation of the top layer of your skin leading to a smoother texture and a more even skin tone. At these low concentrations, glycolic acid products can be safely used every day, but must be consistently used to maintain a fresh, smooth texture to your skin. At higher concentrations, up to 50% (professional grade AHAs), the exfoliating benefits will be more obvious, but they still only last a matter of months. Glycolic acid peels at these concentrations can give similar results as a microdermabrasion – reducing fine lines and wrinkles and giving your skin a smoother and more even toned appearance. Glycolic acid products at low concentrations are also commonly used to prepare your skin for stronger chemical peels performed by medical professionals. Concentrations between 50% and 70% are used for chemical peels by medical professionals to treat severe acne or hyperpigmentation problems. These glycolic acid peels are usually performed every 2 to 4 weeks until the required results are seen and the results can last for up to 5 years. Because of their high concentrations, these glycolic acid peels are only applied for a very short period of time – usually less than 10 minutes. So glycolic acid is a fabulous skin exfoliator, safely removing the outer layer of your skin to reveal new, fresh and beautiful skin. Glycolic acid products are great for people with fine lines and wrinkles, sun spots or age spots, skin discolorations and who suffer from acne or large pores. Due to its exfoliation properties, glycolic acid is included in many serums and peels that help to lighten your skin. People with hyper-pigmentation, uneven skin tones, age spots, sun spots and other pigmentation issues look for natural skin lightening products that will help to ease their problems. Glycolic acid itself does not lighten your skin, but it does help with the turnover of dead skin cells, allowing other ingredients in your serum to assist with lightening your skin and evening out your skin tone. The benefits of home chemical peels won’t be as long lasting or as obvious as those performed using higher concentrations of glycolic acid by medical professionals. Low concentration glycolic acid chemical peels however, used over a period of time at home will help to exfoliate your skin and give you a much brighter and more glowing complexion. Of course, in home chemical peels are much cheaper than those performed by medical professionals and might be all that you need to rejuvenate your skin. You need to decide which is best for your skin and if you are concerned, have a chat with your physician. Over the counter glycolic acid products tend to be of the lower concentrations and because of this, they can usually be used daily. Removes dead skin cells from the top layer of your skin. Helps to clear away blocked pores and blackheads. Assists with treating acne by clearing out deeply blocked pores. Helps to minimize acne scars and other scars. Remember, the higher the concentration of glycolic acid, the greater the skin irritation, redness and flaking. Make sure to wear sunscreen as glycolic acid can make your skin more sensitive to the sun causing sunburn. You can also suffer from dry, red or irritated skin if your skin is not used to glycolic acid. If you are at all worried about using glycolic acid products, talk to your physician or medical practitioner first. What is the difference between alpha hydroxy acids and beta hydroxy acid? Whilst there are a number of alpha hydroxy acids, there is only one beta hydroxy acid which is called salicylic acid. The main difference between these two types of acids is that alpha hydroxy acids are water soluble and the beta hydroxy acid is lipid (oil) soluble. Both are great exfoliators, being able to penetrate your skin and remove dead skin cells and blockages. Beta hydroxy acid however, can penetrate into the pores that contain sebum (because it is oily), so it is more effective than alpha hydroxy acids on oily skin or those with deeply embedded blackheads and blocked pores. Beta hydroxy acids can also irritate your skin and make it very sensitive to the sun, so using sunscreen is again, very important. However, its irritating effects are usually not as strong as those from alpha hydroxy acids, because salicylic acid is derived from aspirin which has strong anti-inflammatory properties. Concentrations of 1% or 2% beta hydroxy acids are usually found in skin care products. How can I include glycolic acid products in my daily skin care routine? There tends to be two different categories of glycolic acid products on the market, those that can be left on your skin and followed by a moisturizer or makeup and those that should be washed off your face and neck. The first type of glycolic acid products, which can be left on your skin, include the serums I review here, but also some creams and lotions. These have a low concentration of AHAs, usually at or below 10%. The second type of glycolic acid products which need to be washed off your skin are usually marketed as glycolic acid peels or fruit acid peels and usually have a concentration between 10% to 50%. These are much stronger and so do need to be removed from your skin. These are the low concentrate serums that you simply include in your daily beauty routine. As they have a low concentration of AHAs and if your skin is not sensitive to these ingredients, then you can leave these products on your skin and you do not need to wash them off. Of course, if your skin seems sensitive to glycolic acid or any of the other AHAs, then always wash the product off your face and don’t use it again. Also, talk to your physician about the problems of using AHAs on your skin. If you want to include an exfoliating glycolic acid serum in your daily routine, then it is best to have just one of your skin care products that contains glycolic acid, rather than multiple products. Use this product as your exfoliant, making sure that your other products do not contain glycolic acid. Using too many products containing AHAs or even beta hydroxy acid can lead to skin irritations, so just be judicious in their use. Moisturizers and serums may be the best formulations for including AHAs in your skin care routine, with glycolic acid serums better than moisturizers, because they penetrate your skin more deeply. These tend to have higher concentrations than the glycolic acid serums which can be used daily – usually between 10% to 50%. So with glycolic acid peels or fruit acid peels, the concentration of AHAs can be quite high and should not be used daily. Due to their high concentration of AHAs these glycolic acid peels should not be left on your skin and need to be washed off with cool water. Always read the recommended instructions that come with each product and don’t overuse them. Your skin can become quite red and irritated with these products, similar to sunburn, so you must be very careful with their use. These higher concentration glycolic acid peels should really be administered by trained aestheticians, rather than being used at home. This is because you can seriously damage your skin if the concentration is too high and you leave these peels on for too long. If in doubt, always have a talk with a medical professional – it is always better to be safe, than sorry. Don’t forget to use a sunscreen when using any products containing AHAs. Read my glycolic acid serum reviews here.